A luxury brand new mediterranean style 4 bedroom,3 bathroom home with a large private heated pool with jacuzzi. Mickey's Retreat is ideally located for visiting the main theme parks, shops,restaurants, and many golf courses. It is located just off the US192 and US27 making it very easy to find if you are a first time vacationer! 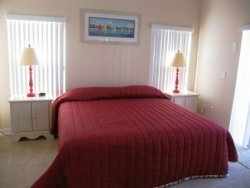 Mickey's Retreat is a true 10 minutes away from Disney's main gate.It has been furnished to a high standard to make your stay a pleasurable one. This home offers 1800 square feet of space to spread out in and relax before planning your next day! Fully air conditioned throughout with ceiling fans in the main rooms. 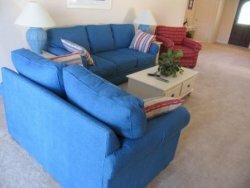 Queen Sleeper sofa with "Love Seat". A 27 inch TV with digital satellite, DVD and a Sony Play Station. Access can be gained to the pool area from the Great Room via an alarmed patio door. The spacious kitchen features a breakfast bar and is fully equipped as you would expect with every modern appliance.Items include full size cooker, dishwasher, microwave, fridge freezer with ice maker, toaster, coffee maker, garbage disposal unit and much more. The open plan kitchen and dining area can accommodate 10. Our kitchen has a tiled floor. Each master bedroom have King Size beds, built-in closets and large private bathrooms.Each has a 19 inch TV with digital satellite. The main master bedroom has access via an alarmed patio door to the pool area. The second master bedroom has access to the pool area via the en-suite acting as a pool bathroom. Each with twin beds. One is decorated in a Surfboard theme and the other in Classic Woody car theme. Both of these rooms feature 13 inch TV with digital satellite. These twin rooms feature a "Jack and Jill" 3rd bathroom. Large private heated (West facing) pool with jacuzzi.The pool area is block paved.There is a covered lanai which offers valuable shade when you want it.A really fantastic spot to sit and have a beer or glass of wine whilst you relax and plan the next day! Fully furnished with patio table, 4 chairs and 2 sunbeds.